Many patients that come in to my office have a common complaint; hair shedding (some even bring in a ball of hair they have collected from their brush and bathroom floor) and in most cases they are women with long hair. 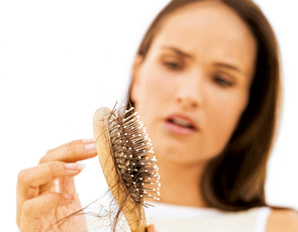 For the most part hair shedding alone is not a sign of hair loss. Shedding is losing thick hair that has completed its growth phase and started its resting phase. All humans experience a level of hair shedding. It can be up to 100 to 200 hairs per day. Hair shedding is sometimes more exaggerated in people who have had a large surgery, trauma, experienced physiological or emotionally stressful events and women who have recently delivered a child. This is called Telogen Effluvium (excessive temporary loss of telogen hair). In most cases hair shedding is typically temporary and the affected hair will grow back within a few months. There is no cause for concern, unless you have a more visible scalp or thinning of the scalp hair. In which case, you should come in to see a certified hair restoration surgeon. Almost every patient that visits US Hair Restoration will have a miniaturization study performed on them, to evaluate their degree of the fineness of their scalp hair which are signs of active hair loss, or in other words scalp hair miniaturization. People with active hair loss show 20-30% more thinning hair than the average person who experiences normal hair shedding. If you feel that you are experiencing active hair loss, we recommend you come into one of our five offices in California( San Francisco, San Diego, Orange County, Beverly Hills and Encino), for a free consultation.